Love the Red Scare titles. This book is directed at high school students and presented in a question and answer format. (Reminds me of the way the Baltimore Catechism is set up, coincidence? hmmm) ALB has quite a few that have graced our website and every time I think everyone knows that the Soviet Union has undergone a few changes in the last few decades, yet another public library hangs on to one of these relics from the past. Of course this is worthy material for academic libraries and archives. But this has no business being a teen nonfiction collection in a modern public library or a school library. Every time I find one like this on the shelf I cringe at the idea of a teen running across this type of title and probably concluding that they don’t “know” anything or “have” anything. Okay. Whining done for now. 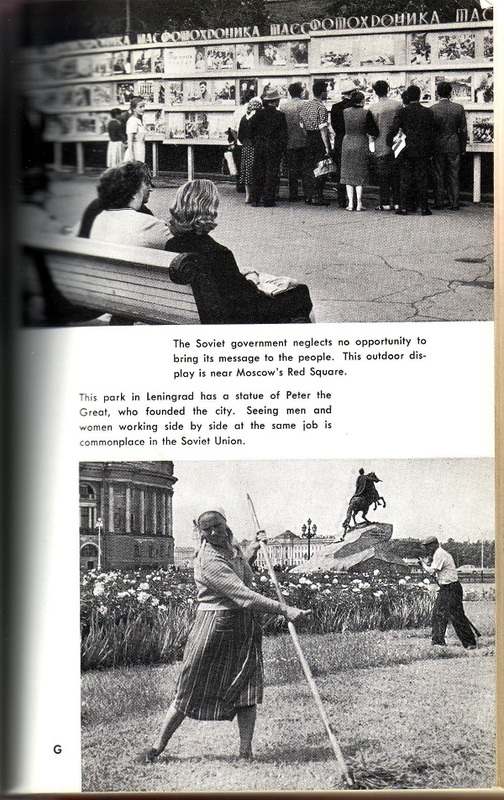 I did love looking through these pages and pictures and the helpful advice about identifying those crazy communists. Next Post:Chomp on this one! 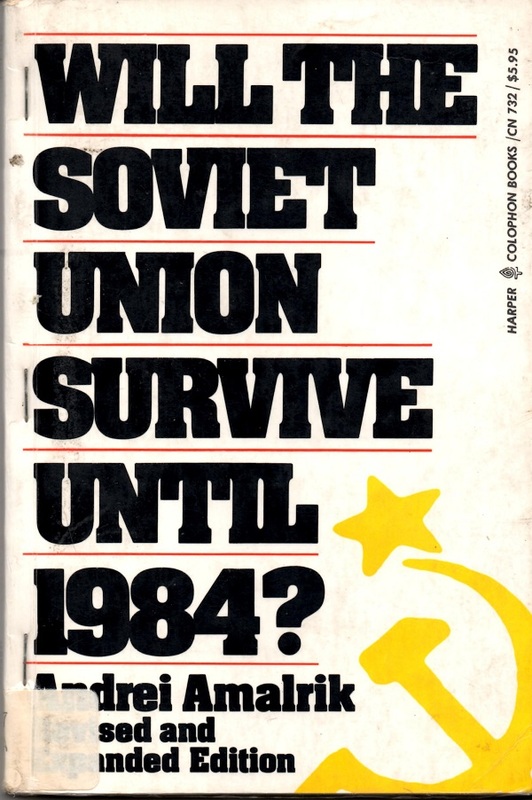 Will the Soviet Union Survive? Who’s Who in the USSR? Men and women doing the same jobs, whatever next? Those sneaky reds probably pay them equally too! i never knew peter the great wore long skirts and babushkas. Chris, I believe it’s dogs and cats living together that comes next. 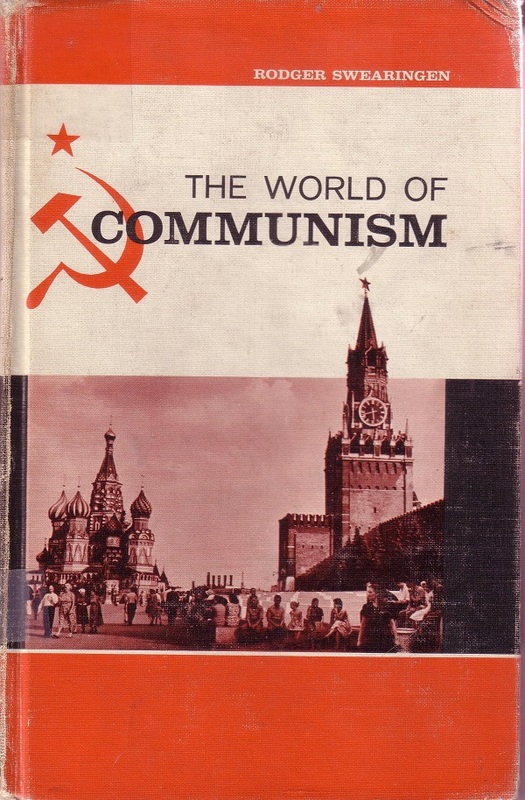 Judging from the cover, it appears that the World of Communism is full of churches! I HuMMMMMMMMMMMMMMing with J April’s comment. 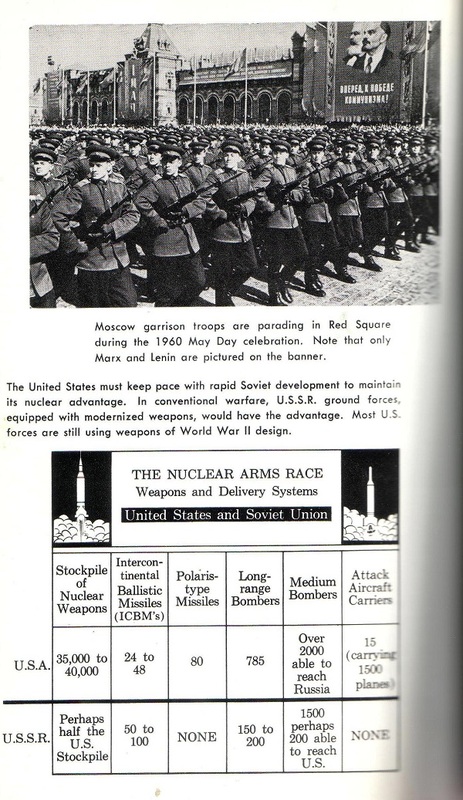 The Russian commies were the “bad guys” when I was a kid. When I grew up, I discovered they had a rich culture full of tapestries, ballet, royalty, folk tales, enameled pins, and painted eggs. Most of this new information came from tv documentaries and, of course, books. Another triumph of information over ignorance. Sorry, “Russian commies” should have been in quotes. We didn’t know the difference between Russia and the Soviet Union. That is a fairly progressive idea. It almost makes up for murdering tens of millions of people. John exists. Communists exist. 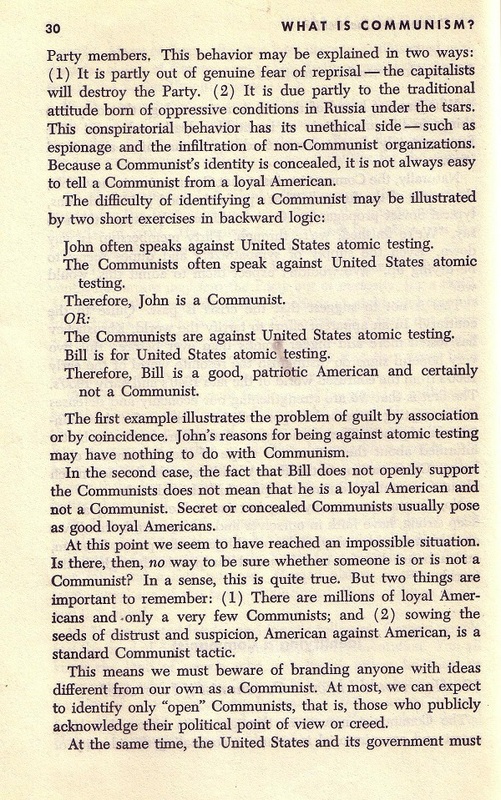 Therefore John is a Communist. @Chris Hunt, yes that was my immediate thought. Maybe you can spot a Commie by his dreadful, wicked support of equal rights for women? Thank the Good Lord & Betsy that book is so out-of-date now! I read somewhere that President Obama is a Commie agent and that he was born in Moscow or Irkutsk or somewhere and that they infiltrated him in by teaching him to look & behave like a loyal American, or something. But maybe President Putin is really working for NATO or the British or someone? Is that it? Anyway, it was on the Internet, so it must be true. I wonder why it’s so important to note that Marx and Lenin are the only two people on the banner. WHY book? WHY? 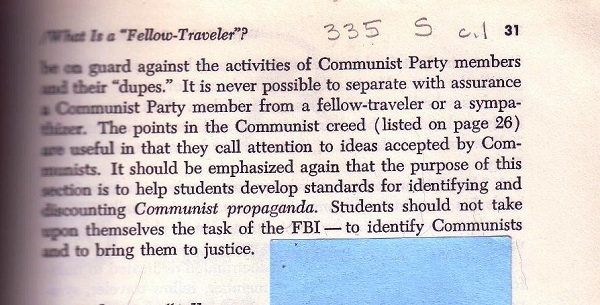 It’s nice at least that they are telling students never to try identifying communists on their own. Leave witchhunting to the professionals! @Sal – My first thought too. Funny how people forget that when it comes to killing Jews, Christians, the handicapped, and homosexuals the Communists killed even more then the Nazis. Ah, kill a commie fer Amur’ca!!! Amber, yeah, where the heck are Trotsky & Stalin & Squealer & Boxer & Muriel & Benjamin?? 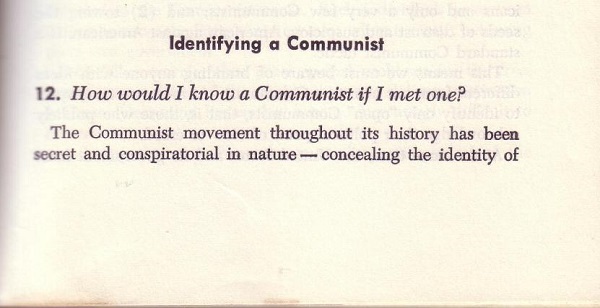 The book doesn’t consider the possibility that one could be a Communist and a patriotic American at the same time. After all, the Russians after about 1920 (yes, that’s where it all went wrong) were more concerned with Russian nationalism than pure communism, hence the terrible treatment of the other states in the USSR. 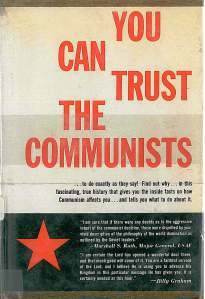 Surely an American might think that Communism would improve America? Not to start a debate but how would it improve it? @Amber: the missing person is Stalin. The crimes of his rule were exposed in 1957, and all his monuments and portraits were removed from streets. @Amber-After Stalin’s death, his successors denounced him and removed his image (or simply ommitted it) from all sorts of places. This book came out when that movement was in full swing. This was a huge turn around from how he was revered when he was alive and was out of step with the lasting cult of personality that Lenin’s legacy had enjoyed. So the author felt it was worth pointing out. Apparently, there is now a movement in Russia that seeks to rehabilitate Stalin’s image. Ick! @Plashing Vole – Yes, there were a number of African-American rights campaigners who were deeply moved by Communism’s ideals of racial equality. You can imagine how well that went down in 1960s America.